One of the standard tools for weather watching and for weather forecasting is the barometer. An Italian scientist named Torricelli built the first barometer in 1643. The barometer measures air pressure, it tells you whether or not the pressure is rising or falling. A rising barometer means sunny and dry conditions, while a falling barometer means stormy and wet conditions. Used in conjunction with a thermometer, a barometer can make general weather predictions. While weather is very complex, storms more or less follow certain patterns of high and low pressure systems. In simplified terms, a rising barometer means wind, frost, or clear skies, while a falling barometer indicates coming storms. A steady barometer might mean precipitation or sun. Weather forecasters look at the relative change at different places, taking into account how air pressure changes with elevation. A good quality barometer should be in the toolbox of all avid watchers/forecasters. Today, barometers are relatively inexpensive and can sometimes be found at garage sales and consignment/thrift shops. Barometric pressure is most often recorded in inches of mercury, millibars, or kilopascals. Some home hobbyist barometers still convert units to inches or millimeters of mercury, whether or not mercury is present. The International Meteorological Society has declared the universal unit of pressure to be the hectopascal. For example, 1016 hectopascals equals 30 inches of mercury (762.1 mm). The three types of barometers readily available today are: the Mercurial (Liquid) Barometer, the Aneroid Barometer and the Electronic Barometer. 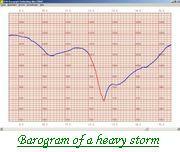 Barometric pressure decrease indicates coming stormy weather, rain, wind, heat. Barometric pressure rise indicates fair, dry, colder weather. Slow, regular and moderate fall in pressure indicates low pressure area is passing at a distance. Any marked change in weather unlikely. Sudden decrease, even if small, indicates a nearby disturbance; normally bringing wind, and short showers. Large pressure drop signals a coming storm in 5 to 6 hours. Large, slow and sustained decrease indicates a long period of poor weather. Coming weather will be more pronounced if pressure started rising before dropping. Sudden rise of pressure,when the pressure is about average or above average and the weather is fair, indicates approach of a low pressure cell, and the barometer will soon start to come down. Rapid rise when the pressure is low, announces a short period of fair weather. If pressure rise is large and prolonged, count on a many days of good weather ahead. Based on a principle developed by Evangelista Torricelli in 1643, the Mercurial Barometer is an instrument used for measuring the change in atmospheric pressure. It uses a long glass tube, open at one end and closed at the other. Air pressure is measured by observing the height of the column of mercury in the tube. 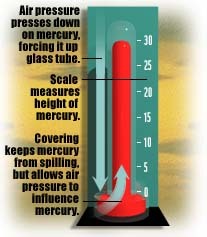 At sea level, air pressure will push on the mercury at the open end and support a column of mercury about 30 inches high. If you used water instead of mercury, you would need a glass tube over 30 feet in length. As atmospheric pressure increases, the mercury is forced from the reservoir by the increasing air pressure and the column of mercury rises; when the atmospheric pressure decreases, the mercury flows back into the reservoir and the column of mercury is lowered. At sea level, the weight of the atmosphere forces mercury 760 mm (29.9 in) up a calibrated glass tube. Higher elevations yield lower readings because the atmosphere is less dense there, and the thinner air exerts less pressure on the mercury. Mercury barometers are mostly found in laboratories and weather stations where very exact measurements of air pressure are needed. Although you could purchase one for home use, I don't recommend it, mostly because they contain substantial quantities of mercury which could pose a threat the health of children and pets (as well as careless adults). An interesting genre of liquid barometers designed for home use are the weatherglasses. Weatherglasses are usually glass vessels shaped like long-spout pitchers or watering cans that react to changes in atmospheric pressure using water as the sensing liquid. 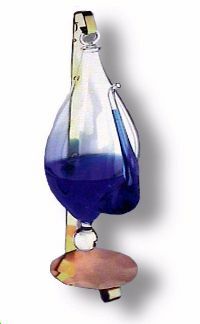 The weatherglass indicates changing pressure through changes in the water level in the barometer's spout. A high or rising level indicates stormy weather conditions present or forthcoming due to a lowering of the air pressure. In extreme situations, the rise may be sufficient to cause the water to overflow the spout. With approaching high pressure, the water level retreats into the vessel bowl, indicating improving weather. The weatherglass -- known also as the storm glass -- dates back to early 17th-Century Netherlands and likely reached North America with the Pilgrim/Puritan colonists. It was among the first weather forecasting tools available to non-scientists to be based on scientific principles. While the weatherglass reacts to temporal changes in atmospheric pressure, most units do not allow reading of pressure changes in standard units nor have indicators to judge smaller pressure trends over short time periods. Therefore, the weatherglass is of minimal aid to the serious weather watcher/forecaster. They are also not as accurate as other methods of measuring air pressure. They are, however, often beautifully handcrafted glasswork that can be a conversation piece or object of decor. Another version of the weatherglass has been attributed to Admiral Robert Fitzroy of HMS Beagle fame and father of the British Meteorological Office . In Fitzroy's instrument, changes in pressure are sensed by changes in the cloudiness of a water solution within the barometer. This weatherglass is also more a conversation piece today than a weather instrument. The Italian mathematician and physicist Evangelista Torricelli (1608-1647) invented the mercury barometer and made important contributions to calculus and the theories of hydraulics and dynamics. 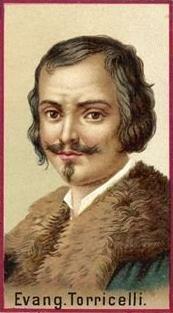 Evangelista Torricelli was born in Faenza on Oct. 15, 1608. 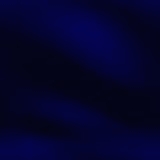 Left fatherless early in life, he was educated by his uncle, who was in monastic orders. In 1627 his uncle sent him to Rome to study mathematics and natural philosophy under Benedetto Castelli, professor of mathematics at the Collegio di Sapienza, who had been one of Galileo's pupils. Torricelli spent the next 10 years in study. He corresponded with Galileo and studied his writings. He was especially impressed by the Dialogues concerning Two New Sciences (1638) and at once generalized Galileo's analysis of projectile motion. His conclusions on this and other subjects were set down in his book De motu gravium (1640; published 1644). Galileo invited Torricelli to Florence in 1641, and he became the amanuensis and companion of the great scientist until Galileo died 3 months later. Soon after, Torricelli succeeded him as grand-ducal mathematician and professor of mathematics at the Florentine Academy. Torricelli experimented with telescopes and simple microscopes, grinding his own lenses, and by carefully controlling their curvature, he produced telescopes superior to most of those of his contemporaries. His most important practical invention was the mercury barometer, first described in a letter to Michelangelo Ricci dated June 11, 1644. 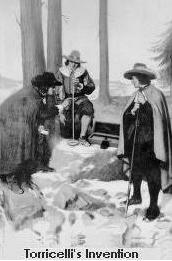 Torricelli had repeated Galileo's experiments with the thermoscope and was led to his discovery when he substituted mercury for water in the tube. He found also that water could be used as the liquid in the barometer if the containing vessel was sufficiently long ("18 cubits," that is, approximately 33 feet), and he realized that the column of liquid was held up by the pressure of the atmosphere. In the course of his experiments, Torricelli observed that the quantities of water discharged from a hole in the bottom of a tank in equal increments of time were proportional, from the last increment to the first, to successive odd numbers. This observation is said to have reminded him of Galileo's law of the velocity of a falling body, and it suggested to him that he should treat the jet of water as a series of freely falling particles, each with a speed determined by the original height of the water surface in the tank--Torricelli's law of efflux. Torricelli saw the advantages of the method of indivisibles, which is used in mathematics to find lengths, areas, and volumes. He thought that the ancients might have used the method in the discovery of difficult theorems, the proofs of which were put in geometrical forms "to hide the secret of their method or to avoid giving jealous detractors an opportunity to object." In a book on the areas of parabolas, he gave 21 propositions on areas, 10 by the methods of the ancients and 11 by the geometry of indivisibles. Torricelli used the methods of so many other mathematicians that he was frequently involved in disputes over priority. Especially bitter was his controversy with G. P. Roberval, which flared up after Torricelli had published in 1644 a tract on the properties of the cycloid. Roberval accused him of plagiarizing his earlier solution of the problem of its quadrature. The controversy was still alive when Torricelli died in Florence on Oct. 25, 1647. Aneroid barometers -- the word aneroid (Greek) means "without liquid" to contrast the genre against the liquid barometers -- are likely still the most common home barometer type. In the last decade or so, electronic barometers have become very affordable, and they may eventually become the most commonly used, although aneroid barometers make useful home decor items as well as being of practical use. The aneroid barometer was invented by a Frenchman, Lucien Vidie, in 1843. In the aneroid barometer, the pressure sensing unit is a small, flexible metal compartment or diaphragm that has been partially evacuated of air and then tightly sealed. 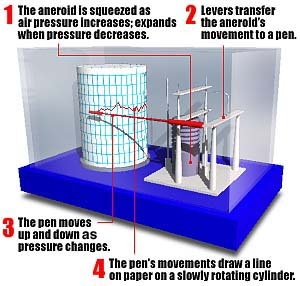 When the external ambient pressure changes, it creates a pressure differential between the ambient air and the air sealed within the aneroid cell. The pressure differential causes the cell to expand or contract in response. The distortion of the cell is "read" though a set of springs or levers (depending on the make) and transmitted to an indicator dial or pointer. The aneroid capsule is very thin, hollow, and usually shaped like a bellows. Most of the air is removed from the capsule so that the contraction and expansion of the capsule is strictly a function of the elasticity of the capsule and any of its supporting springs. Leaving air in the capsule would induce non-linearity into the capsule response. As the capsule contracted, if there were any air left, the air pressure in the capsule would rise, which would make further compression of the capsule harder. The barometer designer calculates how much the aneroid capsule will expand or contract under the expected range of pressures the barometer will be subjected to. Based on these movements, the designer specifies the linkages that will translate the movement of the capsule into the movement of a sweep indicator on the barometer face. The aneroid barometer is sensitive to temperature variations both because the capsule and its linkages will expand or contract as the temperature changes and also because the capsule's elastic properties (how much the capsule will deflect under changes in outside pressure) also change with temperature. There are several ways to compensate for temperature-induced movements of the barometer components. One of the more elegant solutions involves the use of a bimetallic strip. A bimetallic strip consists of two flat pieces of metal, made of different types of elements or alloys, welded back to back. Because the temperature changes in the bimetallic strip and capsule are predictable, the bimetallic strip can be used to compensate for the capsule movements. As temperatures change, the two components of the bimetallic strip try to expand by different amounts. This causes the bimetallic strip to bend toward the component with the smaller coefficient of expansion. This bending motion can be used to shift the indicator hand or compress the aneroid capsule to compensate for the temperature change. The linkage between the aneroid capsule and the sweep indicator is almost as complex as the movement of a fine Swiss watch. In fact, a quality barometer linkage incorporates many of the same components. The linkage's purpose is to translate the tiny horizontal motion of an expanding bellows (a few thousands of an inch or centimeter) into the sweep motion of an indicator arm. The required magnification of the capsule movement can be accomplished using levers. A see-saw is a form of lever. The very end of the see-saw moves through a much greater arc than a point near the pivot. By arranging for the aneroid capsule to push or pull on a point near the pivot of a see-saw-like lever, the movement of the capsule is greatly magnified at the far end of the lever. Any nonlinearity of the capsule movement can be compensated for using a fusee, pronounced FU-say. A fusee, which was invented by Leonardo da Vinci, is a spiral-cut pulley shaped like a cone. At the zero point of the barometer, the end of the see-saw lever is connected to the middle of the fusee by a chain. 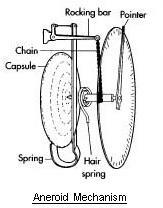 As the aneroid capsule compresses, the fusee rotates, shifting the chain down to a smaller diameter. What this accomplishes is that as the aneroid capsule hardens under compression, a smaller movement of the chain can produce the same movement of the sweep indicator. The Aneroid Barometer should always be mounted in a vertical position by screwing it to a bulkhead, through an anti-vibration mounting ring, if necessary (on ships f.e.). It should never be mounted horizontally. The height of the barometer above the floor should be the mean height of the eyes of the observers who will be using it. It is better to mount the instrument slightly too low than too high. Before taking a reading, tap the face of the barometer gently with the finger to release any static friction in the bearings. When reading the barometer the line of sight from the eye to the end of the pointer should be perpendicular to the face of the barometer, otherwise there may be an error in the reading due to Parallax. You will notice that there is a mirror in the form of a narrow ring on the barometer face just inside the hectopascal scale. When making a reading move the eye so that the pointer hides its reflection in the mirror. The line of sight will then be perpendicular to the face and the paral-lax error will be minimized. Read the indicated pressure, estimating to the nearest tenth of a hectopascal. Aneroid barometers are ideal for the weather enthusiast as they are often very inexpensive, portable and sufficiently accurate for most uses. Aneroid barometers are often combined with thermometers and hygrometers into a "home weather station" to make interesting pieces for home or office decor. Aneroid barometers travel well -- they have been used by mariners for over a century -- and can thus be easily carried out into the field. However, their mechanisms can be shaken out of alignment with rough handling, such as driving down a washboard road or over rough terrain, so take some care when transporting them. 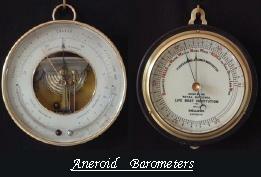 There are two common variations on the aneroid barometer also available: the altimeter and the barograph. A barograph is a recording aneroid barometer. It produces a paper or foil chart called a barogram that records the barometric pressure over time. Because the amount of movement that can be generated by a single aneroid is minuscule, up to seven aneroids (so called Vidie-cans) are often stacked "in series" to amplify their motion. It was invented in 1843 by the Frenchman Lucien Vidie (1805-1866). As atmospheric pressure responds in a predictable manner to changes in altitude, barographs may be used to record elevation changes during an aircraft flight. Barographs were required by the FAI to record certain tasks and record attempts associated with sailplanes. A continuously varying trace indicated that the sailplane had not landed during a task, while measurements from a calibrated trace could be used to establish the completion of altitude tasks or the setting of records. Examples of FAI approved sailplane barographs included the Replogle mechanical drum barograph and the EW electronic barograph (which may be used in conjunction with GPS). Mechanical barographs are not commonly used for flight documentation now, having been displaced by GNSS Flight Recorders. 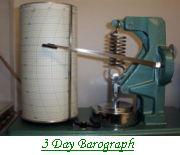 Nowadays, mechanical recording barographs have commonly been superseded by electronic weather instruments that use computer methods to record the barometric pressure. These are not only less expensive than mechanical barographs but they may also offer both greater recording length and the ability to perform further data analysis on the captured data including automated use of the data to forecast the weather. On the top right of the picture of the three day barograph can be seen a silver knurled knob. This is to adjust the barograph so that it correctly reflects the station pressure. Barely visible below the knob is a small silver plunger. 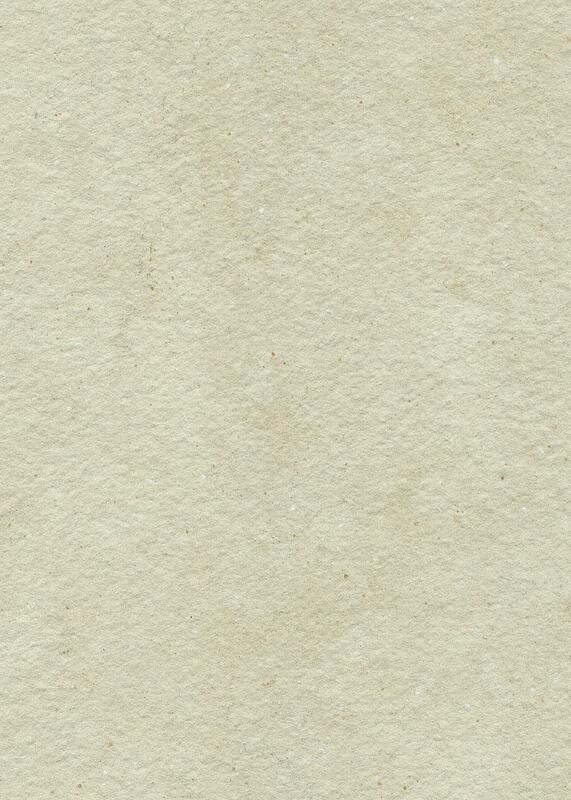 This is pressed every three hours to leave a time mark on the paper. The line between two of these marks is called the 'characteristic of barometric tendency' and is used by weather forecasters. The observer would first note if the pressure was lower or higher than three hours prior. Next, a code number would be chosen that best represents the three hour trace. There are nine possible choices (0 to 8) and no single code has preference over another. In the case of the graph on the barograph, one of two codes could be picked. An 8 (steady then decreasing) or 6 (decreasing then steady). The observer should pick the 6 because it represents the last part of the trace and is thus most representative of the pressure change. In the bottom centre is the aneroid (large circular silver object). As the pressure increases the aneroid is pushed down causing the arm to move up and leave a trace on the paper. As the pressure decreases the spring lifts the aneroid and the arm moves down. After three days the drum to which the graph is attached is removed. At this point the clockwork motor is wound and if necessary corrections can be made to increase or decrease the speed and new chart is attached. Electronic barometers use detection cells whose resistance or capacitance level changes sufficiently with air pressure to react to the small changes found in the atmosphere. The detection cell can be connected to electronic circuits or microprocessors in various ways to provide a wide range of possible applications. The reading outputs on some units can be downloaded to a computer for storage and analyses. Electronic barometers can be configured to produce altimeters and barographs, or all three at once, stepping between functions with the push of a button. These barometers are usually fairly rugged, very portable and reliable for most uses, and well within the budget of most weather enthusiasts. Several have been designed for outdoor recreational usage and are quite compact in size.